Apache Kafka is publish-subscribe messaging rethought as a distributed commit log. It is scaleable, durable and distributed by design which is why it is currently one of the most popular choices when choosing a messaging broker for high throughput architectures. One of the major differences with Kafka is the way it manages state of the consumers, this itself is distributed with the client responsible for keeping track of the messages they have consumed (this is abstracted by the high level consumer in later versions of Kafka with offsets stored in Zookeeper). In contrast to more traditional MQ messaging technologies, this inversion of control takes considerable load off the server. The scalability, speed and resiliency properties of Kafka is why it was chosen for a project I worked on for my most recent client Sky. Our use case was for processing realtime user actions in order to provide personalised Recommendations for the NowTV end users, a popular web streaming service available on multiple platforms. 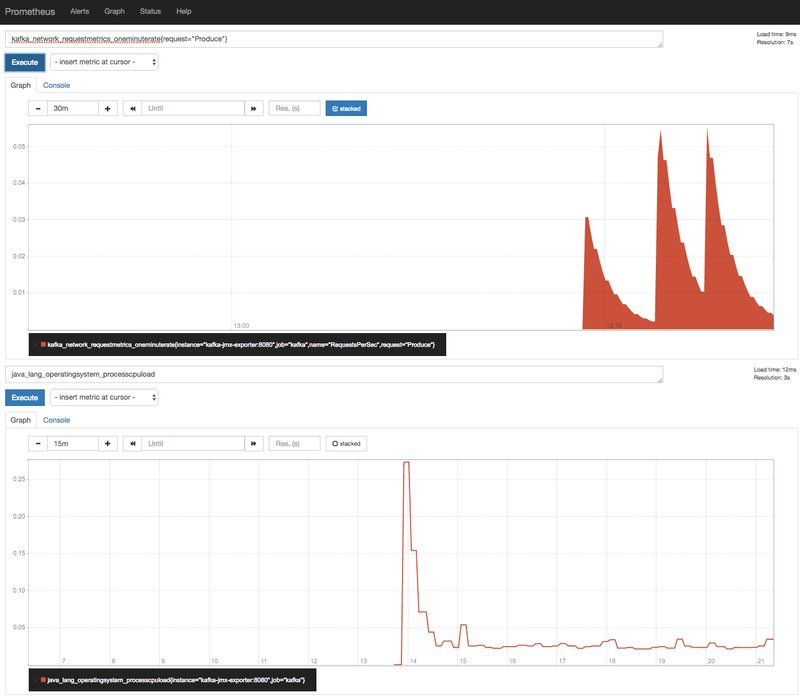 We needed a reliable way to monitor our Kafka cluster to help inform key performance indictors during NFT testing. 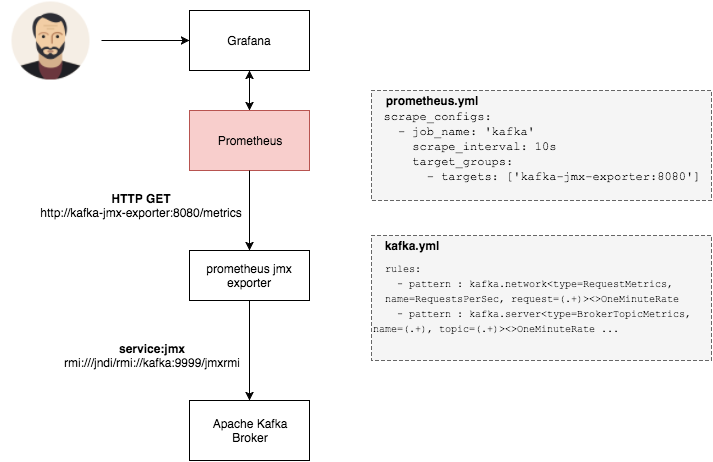 Prometheus is our monitoring tool of choice and Apache Kafka metrics are exposed by each broker in the cluster via JMX, therefore we need a way to extract these metrics and expose them in a format suitable for Prometheus. Fortunately prometheus.io provides a custom exporter for this. The Prometheus JMX Exporter is a lightweight web service which exposes Prometheus metrics via a HTTP GET endpoint. On each request it scrapes the configured JMX server and transforms JMX mBean query results into Prometheus compatible time series data, which are then returned to the caller via HTTP. 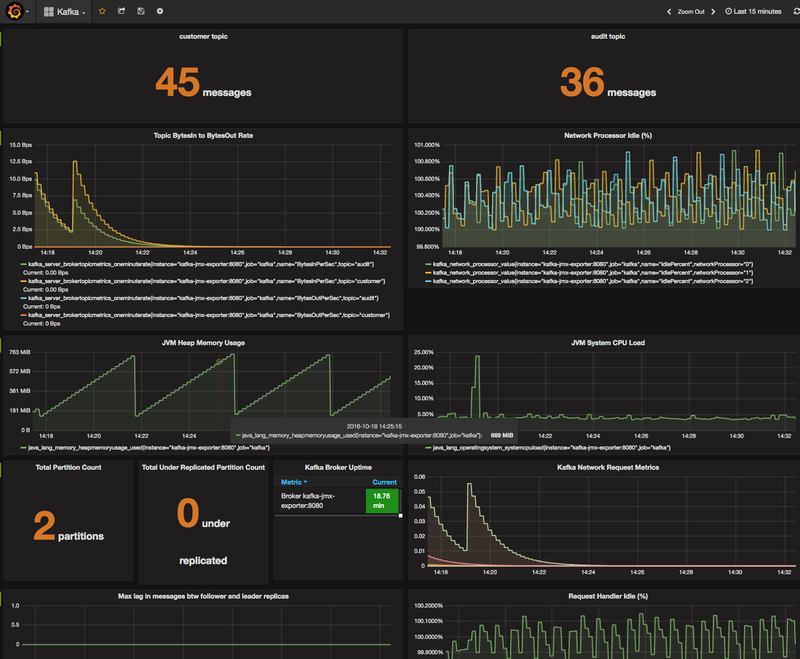 Once metrics have been scraped into Prometheus they can be browsed in the Prometheus UI, alternatively richer dashboards can be built using Grafana. In order to try this out locally, a fully dockerised example which has been provided on GitHub – kafka-prometheus-monitoring. This project is for demonstration purposes only and is not intended to be run in a production environment. This is only scratching the surface of monitoring and fine-tuning the Kafka brokers but it is a good place to start in order to enable performance analysis of the cluster. A note on monitoring a cluster of brokers: Prometheus metrics will include a label which denotes the Brokers IP address, this allows you to distinguish metrics per broker. Therefore a JMX exporter will need to be run for each broker and Prometheus should be configured to poll each deployed JMX exporter.